Ted opened the meeting by saying that the committee has come a long way and that the biggest challenge will be to get the word out about the event. Introductions were made around the table. The minutes of previous meetings were approved. There has been some email discussion about the design for the commemoration crest. Ted showed a draft design. Ted had sent letters asking for support to Janice Thompson of the Niagara-on-the-Lake Chamber of Commerce and to Gary Burrows, Lord Mayor of NotL. Ron is on the board of the Chamber of Commerce and suggested that the committee call to arrange to make a presentation. Their next board meeting is Tuesday, September 14. Gary Burrows is supportive and suggested meeting with the parks and recreation director. The NotL Historical Society is preparing a display about WJ'55. They would like to dedicate the floral garden by the golf course to the Jamboree commemoration next year. This should be brought up at the meeting with the city. The Scout Brigade of Fort George has invited the committee to hold a meeting during their event, specifically in the afternoon of Saturday, September 18. This will provide an opportunity discuss how the commemoration program could fit with the SBFG program. They have also invited the committee to join them for dinner that evening. Bill C. has been in contact with Mike Scott, Scouts Canada's Chief Commissioner, who is very interested. 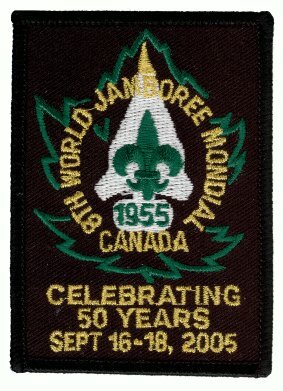 Bill will meet with Mike and will discuss permission for the use of the Jamboree emblem, communicating with the WOSM, and appointing a liaison between Scouts Canada and the committee. John Rietveld, CEO of the Scouts Canada Foundation, is supportive. It was generally agreed that any surplus from the commemoration should be given to the Foundation for the purpose of supporting international Scouting. Ron stated that making a plaque takes about three weeks from the time the design is approved. He is the person who must approve the design and its placement. The 2005 Scout Brigade of Fort George and the WJ'55 commemoration will be September 16-18. Methods of getting publicity for the event were discussed. A representative of the committee will probably have to attend meetings of various organizations in order to publicize the event. Tourist information for summer 2005 will be going in within three to four months. Planning for the banquet will require an estimate of the number of people who will attend. The Scout Memorabilia Collectors of Canada would like to hold an event during the commemoration. Ted will contact Murray Fried regarding this. The Badgers' Club and the Scouts on Stamps Society International (SOSSI) may be interested in holding meetings during the commemoration. The SOSSI voted to add "International" to its name during WJ'55. Boat tour. Ron mentioned that a tour boat will operate from the Navy Hall dock next summer. Building a replica campsite complete with Bell tents. Participants may camp on the original Jamboree site (tents only). Those wishing to camp in trailers may do so at the nearby Shalamar Lake commercial trailer park. A shuttle bus could be operated between there and NotL. The Niagara Falls Scouting Museum has artifacts from the Jamboree. It might be possible to mount a mobile display of some of these in the Navy Hall or some other place in NotL. To successfully attract print publicity, the committee will need to identify the human interest angle; the unique stories that make the Jamboree and the commemoration special. For example, the mayor of NotL did not have a chain of office until one was made in time for WJ'55. Bill C. moved to Canada from Northern Ireland after attending the Jamboree. There needs to be a communications strategy to build momentum in the community. Bill C. will speak to Mike Scott about an article in the Leader magazine. Tony and Bill L. will write a press release and backgrounder. Ron has contacts with the wire services. Ted will contact Mike Reid, a Scouter in Montreal with video production experience and media contacts. Lou Cahill worked for the public relations firm OEB International and may have worked on publicity for WJ'55. Bill C. will contact him. Mr. Cahill was also the president and an association of Canadian weekly newspapers. George will get service club contacts to Ted who will send information and ask for their help. Ted will also follow up with the NotL Chamber of Commerce. The Chamber's newsletter will be published within a month. Liam will register a domain name and arrange for a web site for the event. Shore and Willey were the official photographers for the event. George will approach Donald Willey, son of the photographer, to see if he would like to participate and if he has any photos that we could use.